The Competition Zone is designed as a “circuit of guest experiences” and contest elements. Contest Excitement - Prizes we will be given out to the daily highest individual and team scores. Teams will form between friends and companies. At shows end, trophies will be handed out to the best individual and team circuit winners. The combination of individual and team competition, creates an amazing foundation for a great marketing campaign that drives registration, show floor traffic and sponsorship sales. Scoring & Leaderboard - Team and Individual scores will be projected in real time on a large video monitor. Watch as teams gather to check their scores against the competition. The circuit will consist of four activities that will challenge participants mentally, physically and provide a spirit of fun. 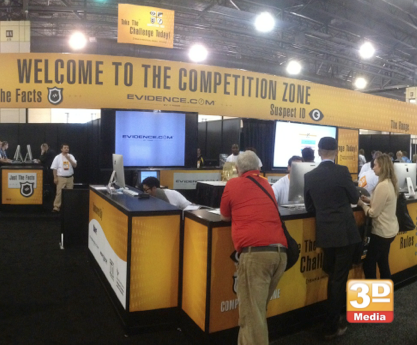 Brand Emersion – Bold graphics wall dominate this booth, complete with your branding. Each prospect spends 15 minutes at this promotion. Your message will be heard and remembered. Data Capture – All guests must answer sales qualifying questions to participate. Your sponsor creates the questions, we report them. Projected Performance - This promotion runs 98% to capacity, 1,500 lounge visits, the average guest spends 20 minutes engaged with your brand in booth. Including t-shirts, signage and traffic cards, we estimate 220,000 ad impressions. Competition Zone Games: You select the contest games, choose between: driving skills, basketball toss, industry trivia, memory recollection, Wii Dance and more.